Russell New Zealand was once known as The Hell Hole of the Pacific. I wake up early to find out whether it still lives up to its name. I am going on a helicopter tour of the Bay of Islands this morning (read that adventure here) but first I need to gather some energy with a big breakfast. 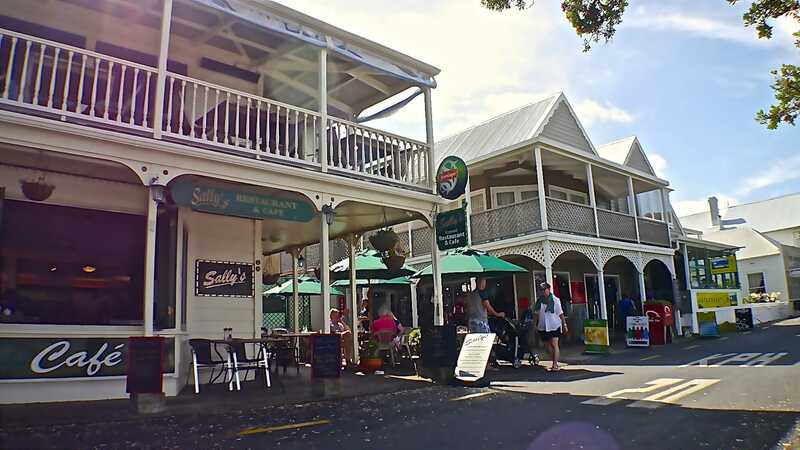 Paihia’s main raison d’etre is its location at the heart of the Bay and so it has all the facilities that a visitor may need including quite a few restaurants and cafes. But, unable to stand still, I had to jump on a ferry to Russell New Zealand, across the bay, for breakfast and a quick visit of this heritage town. It is said that Russell was the first port in New Zealand and thanks to the thriving trade and exchange of goods between the local Maori and the European settlers it became a very busy town known for its excesses. Prostitution, alcohol and general debauchery were the norm giving it the nickname of “The Hell Hole of the Pacific”. Today, it couldn’t be farther from that. Sleepy, relaxing and with a population of less than 1,000 the Russell that I found was pleasantly quiet and the perfect place for a retirement home. I bet most of my companions when I sat for breakfast, fit the bill. 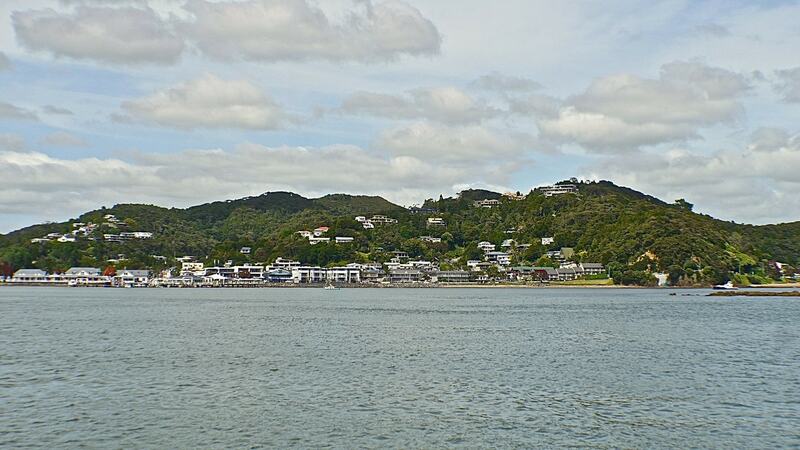 Apart from a short strip of waterfront cafes and souvenir shops there is not much more to Russell New Zealand. Many of the expensive holiday homes you can see from the air belong to the wealthy. 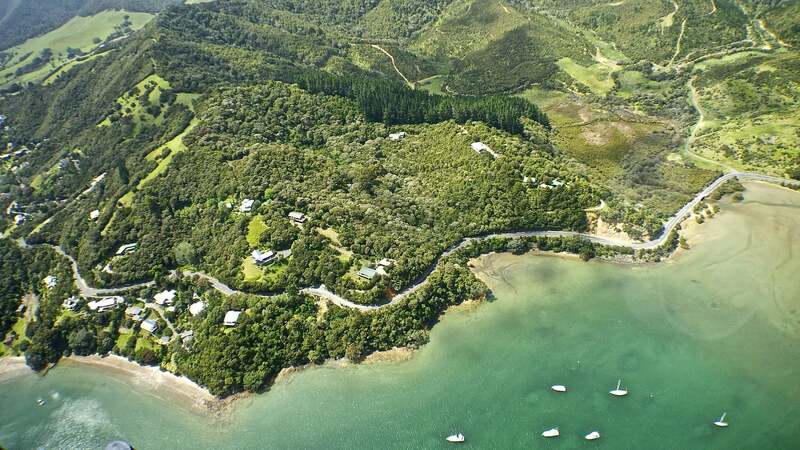 If money is no object, you can also chose to stay at New Zealand’s most expensive property: Eagle’s Nest, a set of 3 villas that go for almost $2,000 a night and which are located close to Russell New Zealand. Aside from the shuttle ferry from Paihia you can also get there through a scenic road which is long and windy, although very beautiful if you have 3h to spare at least. I wander around the streets of Russell and take in the atmosphere. There are people reading the newspaper and enjoying the light breeze and the sun, still weak but getting warmer by the minute. The architecture, like in most of rural New Zealand, is colonial and reminds me a lot of Canada. Wooden houses and structures with verandas and steep roofs. Russell’s historical background and splendor can be seen in some of the buildings, many of which are over 100 yeas old. 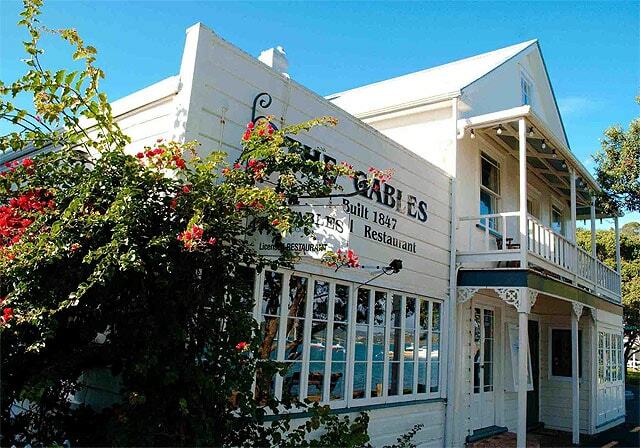 The Gables restaurant, on the waterfront, is considered the longest operating restaurant in New Zealand originally starting as a Bourdel serving the whaling industry and traders of the time circa 1850s. The original fireplaces are still there as are the kauri floors. Historical places abound. Next door to the Gables, on the other side of the pier, The Duke of Malborough Hotel has been in operation since the early 19th century and holds the first alcohol license in the country. You could send the whole day sitting on its veranda watching the day go by and the ferries come and go. on Flagstaff Hill you can still see the original New Zealand flag for 12 days a year. The country’s first church was built here offering service in Maori and the English language since 1836. Just wandering around the town looking out for quirky and historical signs is a bliss. Russell has done well for itself and almost 200 years since its establishment, it has reemerged as the playground of the rich and a pleasant trip down memory lane.